23rd Farzan Clinical Research Center, Research, Tehran, İRAN Introduction: Bispectral Index monitoring improves the titration of anesthetic drugs and decreases the recovery time of general anesthesia. The aim of this study was to evaluate the effects of Bispectral Index monitoring on the recovery profile of elderly patients undergoing surgery with general anesthesia. 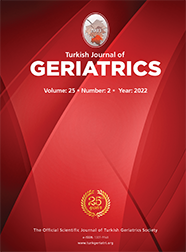 Materials and Method: In this randomized, single blind controlled trial, 68 elderly patients were enrolled. Blocked randomization was used to allocate the patients to 1 of 2 groups (intervention and control groups). In the Bispectral Index group, the inspiratory concentration of isoflurane was increased until the patient reached a Bispectral Index of 45-65. If a patient developed hypertension or tachycardia, 50 μg of IV fentanyl would be administrated. The time to regain consciousness was the primary outcome of the study and the extubation time and time of discharge from the post anesthesia care unit were the secondary outcomes. Results: The mean extubation time in the Bispectral Index and control groups, in minutes, was 7.34±0.48 and 11.23±0.49, respectively. The mean time to regain consciousness was 20.2±0.79 in the Bispectral Index group and 29.91±1.31 in the control group. The average time of discharge from the postoperative care unit was 26.62±0.78 for the Bispectral Index group and 37.44±1.44 for the control group. All of the differences were significant (p<0.0001).